Gustav Klimt, “(Portrait of) Friedericke Maria Beer-Monti”, 1916. Last weekend I went to the Textile Museum in Washington, DC, to see “Textiles of Klimt’s Vienna”. I think they used Klimt’s name to pull in visitors, since the exhibition was only indirectly about Klimt (with the exception of one painting, shown above) and was really about the textiles produced by the Wiener Werkstaette (Vienna Workshop, which I will call the WW) which was active from 1903 to 1932. Please visit that link to see the range of items the WW artists created and some venues in which they appeared. Klimt helped set the stage for the WW as one of the founders of The Secession in 1897. The other founders were architect Josef Hoffmann and painter Koloman Moser. The goals of Secession artists were to make art a part of all aspects of life and eliminate any distinction between “high art” and “craft”. Many art groups of the time were almost like political parties, organized with explicit goals and arguing stridently with other groups. Hoffmann and Moser established the WW as a way to produce (and sell) art according to Secessionist ideals. It approved its members’ work only if they demonstrated outstanding individuality, exquisite craftsmanship and beauty. The WW’s motto was “Better to work 10 days on one product than to manufacture 10 products in one day.” Textile and fashion divisions, added in 1909 and 1910, shifted the WW’s emphasis away from the architectural. The clientele mainly consisted of artists and the open-minded, progressive and financially well-to-do upper middle class, not the masses. Austria’s failing economy and end of empire after WWI helped bring about the eventual demise of the WW. About three-quarters of the way down is a design called “Notschrei (Scream for Help)”; I have no idea why the name is so dramatic except perhaps in a marketing sense. There were photographs of that design used for carpeting and furniture; it seemed to have been a popular design. Among the samples on display from several designers, many fabric names seemed to refer to places such as “Japanland”, Ireland, Rhodesia, Rome, the Azores; various birds (White Gyrfalcon; Hawfinch, Eagle); others were simply descriptive of a botanical theme. I can imagine many of these styles of prints being used in 1920s-30s era patchwork quilts, or retro fabrics today. One of the featured designers at this exhibition was Maria Likarz-Strauss. I was hoping to write this essay about her, but could not find enough information. The brochure at the Museum gives her dates as 1893-1956. She began working at the WW in 1912, went to Germany from 1916-1920, and then returned to the WW. She was its most prolific textile designer, creating over 200 patterns. Her versatility in design included fine line drawings, simple monochromatic patterns, and some abstract designs that preceded Art Deco by 20 years. 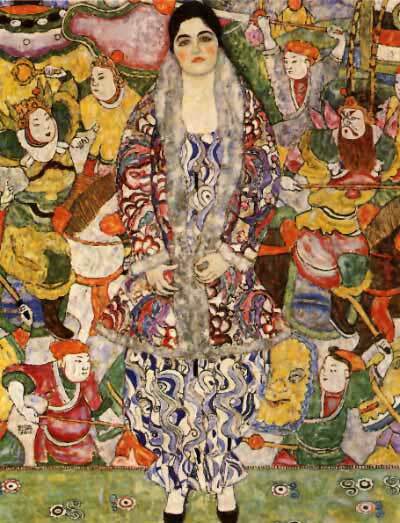 About Klimt’s painting, above: Friedericke was a WW client, buying all her wardrobe and furnishings from them. Her dress fabric was the “Marina” design by Dagobert Peche. Over the dress she is wearing a fur jacket, but it is inside-out to show the lining — another WW fabric. Note the Japanese design of the background; apparently Klimt was very fond of such Japanese screen prints, but in the paintings of his I have seen, no others had such a busy, pictorial background. And not-quilt-related — right next door to the Textile Museum is the Burmese (Myanmar) Embassy. So if you go, you can witness people protesting the troubles in that country. It’s amazing to me how this movement of great design worked into great commercial textiles flourished all over Europe at this time. It’s linked to the arts and crafts movements, of course, and I suspect arises from to move commercial products into the modern era of good design — the kind of movement you see in the earlier British Arts and Crafts movement — Morris wallpapers, etc. And later, Bauhaus in the 1920’s profited from the Vienna Workshop — Maria Likarz (as her name is cited) has a couple of entries, one with a gorgeous photo of a textile print, in “Women’s Work: Textile Art from the Bauhaus” (by Sigrid Wortmann Weltge, 1993). I am always stunned and delighted to find our artistic ancestors, working away as we do, with some of the same difficulties. Leonore Tawney, by the way, was influenced by the Bauhaus refugees, many of whom ended up in the US prior to WWII. I too was struck by the background to the Klimpt painting. There’s a wonderful Matisse-like feel to it, pattern on pattern. The Asian element in the background functions, for me, to make the worman’s coar look like a traditional Uzbeckistani or perhaps Turkish textile. You are so lucky to live so near this fabulous museum. Thanks for keeping us in the loop about exhibits there.